IDEA Cellular has announced a new lifetime prepaid offer, LIFE TIME PLAN 22 for customers in Karnataka. In this offer customers (old/new) has to e-recharge with Rs 22 to get all local calls at Re 1/min. One can opt starter kit (including SIM) for 49 or 99, and then recharge Rs 22 for Lifetime.Rs 22 e-recharge also gives Rs 3 talk-time in customer’s balance. SMS costs Re 1 for local ones, Rs 1.50 for National ones. STD calls are charged at Rs 1.50/min to maintain the lifetime connection customer needs to recharge with a minimum value of Rs 200/- once in every 6months. Regular processing fee on subsequent recharges is applicable. Apart from the base value, one can go for Daily Rental Re 1 for local calls Idea to Idea at 0.50p/min and Idea to other mobile at 0.60p /min. You can also e-recharge with Rs 37 to get it for a period of 30 days. 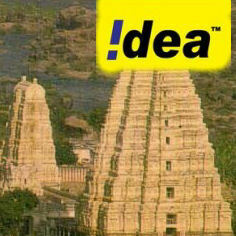 Idea also launched STD pack – eRecharge with Rs 34 makes all STD Calls only to IDEA Mobile& landlines at Re 1/min. Night Calling Pack: e-Recharge with Rs. 49 to call unlimited in Night (11:00PM to 07:00AM) local Idea to Idea ;valid for 30 Days. C. Recharge with Rs 30 for national SMS at 50p. Please note that no free or discounted SMS will be available on the Blackout days between 00:00 hours to 23:59 hours i.e. Regular SMS charges (Local-Re1, National-Rs 1.50, International-Rs 5) will be applicable on the following days New Year, Friendship Day, Diwali (Eve), Diwali, New Years (Eve). 1.free sms without rechrge 35 rs.extra sms card or if recharg with sms card then give atleast 500 sms…………..
ALTAF who is the “US” … where are you located ?